A little girl called Rose is an asylum patient, afflicted with mental images of death and other macabre visions. With the help of her psychic powers, she starts unraveling a plot against her life by an evil doctor. 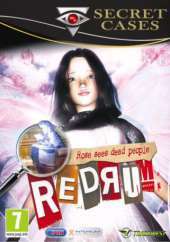 Redrum is a horror-themed hidden object game. As usual, the objective is to find and click on all the objects from a list, as they lay scattered on gruesome scenes of murder and other creepy places. Roses are also hidden on the scenery. They add more hints to the magnifying glass at the bottom that, when clicked, highlights the location of one of the list items. There are two modes, with or without the time limit. A bonus round appears at the end of each chapter. In one of them, the player has to make anagrams with refrigerator magnets. Another makes the screen all segmented, and replaces the object list with the screen portions that must be found. In one, the goal is to find several instances of the same object.